Alton Jones pulled his 49 pounds worth of fish in the Knockout Round from the center of buck brush and willow bushes. 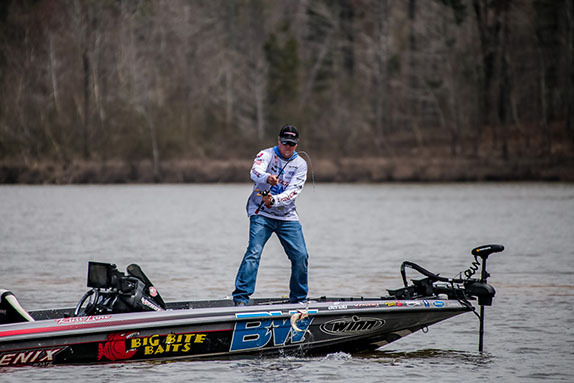 Prior to the start of the Bass Pro Tour event in Raleigh, N.C., Alton Jones said the event should be right in his wheelhouse. The veteran from Texas backed up his words in the Knockout Round. "It was a fun day, but I had to work for every bite I got," he said. "Once I figured out how to get some bites, I just had to find as much of that kind of water as I could and cover it effectively. It wasn't like I had a magic spot or anything like that." Jacob Wheeler led for much of the day before succumbing to Jones' 20-pound final period. He finished with a 46-01 aggregate on 16 fish. Jacob Powroznik, a Virginia resident who undoubtedly has more experience on Shearon Harris than anybody in the top 10, was 3rd with 39-10 (10 fish). 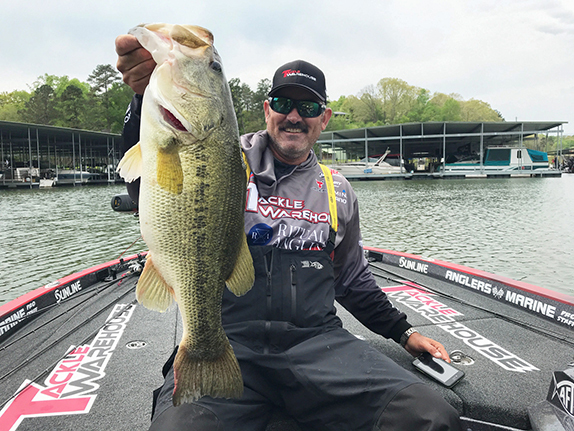 He started the final period in 20th place, but caught 30 pounds (including a pair of 8-pounders) to move up 17 positions. 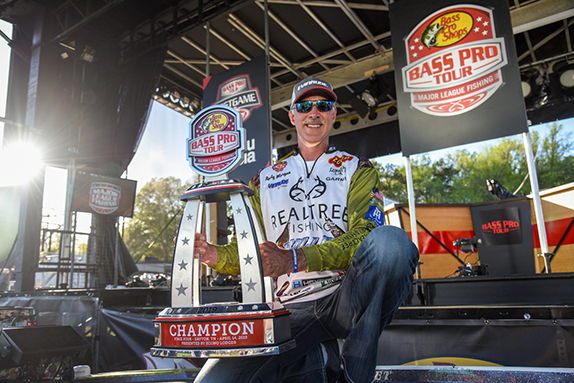 Bassmaster Classic champion Ott DeFoe was 4th with 36-03 (18 fish) and two guys who've made the Championship Round in all three BPT events � Jeff Sprague and Edwin Evers � occupied the 5th and 6th positions. 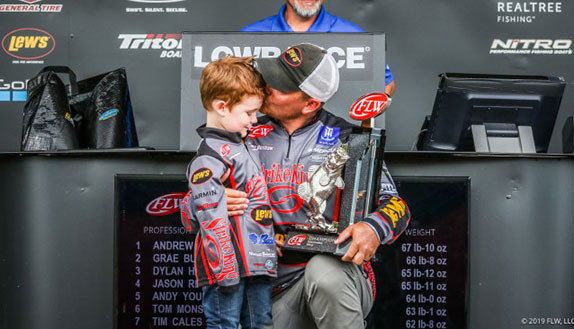 Sprague caught nine fish for 28-01 and Evers, the winner of the previous event at Lake Conroe and the Angler of the Year points leader, boated eight for 27-12. The remainder of the top 10 was comprised of Takahiro Omori (10 fish, 26-06), Jared Lintner (9, 24-02), Mark Daniels Jr. (7, 23-02) and Russ Lane (14, 22-12). All are excited to take a crack at Shearon Harris, a 4,100-acre fishery that kicked out 40-plus-pound limits for a local tournament angler on back-to-back weekends in 2017. The bass there are likely further along in the spawning process than they were at Falls or Jordan Lake (site of this event's shotgun round), but clouds and some morning showers are in the forecast and sight-fishing isn't expected to be much of a factor. Jones fished far up the Neuse River and used a flipping stick with a Yum Bad Mamma (a Beaver-style bait) to amass his day-best haul. In addition to his 7 1/2-pounder, he also had a 6, a 5-02 and two that exceeded 4. He had to skip the bait to reach his target on most presentations. "I was targeting buck brush and willows in less than a foot of water," he said. "The water was really dirty and the fish were up super-shallow. If I wasn't grinding mud with my trolling motor, I wasn't shallow enough." He said the fish were right on the verge of transitioning to the spawning beds. 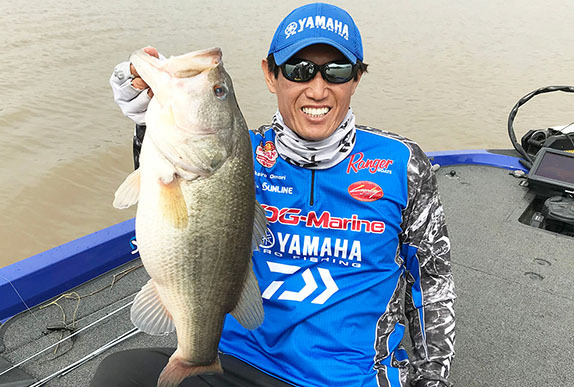 This 7-pounder with 4 minutes left in the day put Takahiro Omori in the Championship Round. "The way I could tell is I had to pitch right to the heart of the bush to catch them. When they're spawning, they'll be off to the side of the thickest part, but these were in the shadiest, gnarliest stuff. This whole area is about to bust wide open and maybe it'll happen on Shearon Harris." The anglers had an opportunity to scout Shearon Harris earlier in the week on one of their off days. It was a look-only affair with no fishing allowed. "I went and rode around and I really don't know what to expect," Jones said. "People say it's the best of these three lakes, but that's hard for me to believe because the others are so great." 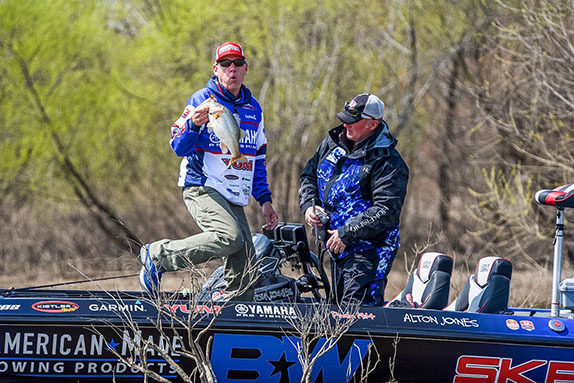 Wheeler had a big weight cushion after a strong performance in the Shotgun Round and didn't need (or even want) to catch anything on his Elimination-Round day at Falls. He scouted around for 7 1/2 hours and found the place in the upper portion of the lake that he exploited in the Knockout Round. "I shook off 30 to 40 pounds (in the Elimination Round) � I didn't catch them because there was no value to them at that point. I wasn't too worried about where I finished that day. "A lot of the fish I caught today were actually spawning on isolated grass patches and subtle stuff like twigs or stumps. Some of that stuff I could barely see and some I found (with his electronics). Russ Lane held onto the No. 10 position in the standings despite not catching a fish in the final hour of the day. "I was marking some of it and then I'd come back and throw a vibrating jig over it. I was flipping to the stuff I couldn't see." Omori flipped up a 7-pounder with 4 minutes left in the day to climb inside the cut and bump Forrest Wood Cup champion Justin Atkins out. "Until I saw that one jump, I didn't know how big it was," he said. "The way I was fishing today, I got a lot of bites, but I lost a lot of fish. I was fishing for bigger fish, too, and at the end of the day the water warmed up enough and I knew where to go. It all came together." Lane earned the final spot in the Championship Round despite not catching a fish over the final 72 minutes of the day. He boated a 4 1/2-pounder late in the second period and the last one he caught was nearly 3, but his 12 other fish were all under 2 pounds. He knew from the ScoreTracker updates that the string of small fish he was catching on a Spro Fat Papa 55 crankbait, a Spro McStick jerkbait and a Big Bite Baits Coontail worm was keeping him around the cut line, but he was banking on hooking some bigger specimens with a spinnerbait once the wind started blowing in the third period. That didn't transpire, but he survived anyway. "It was a crazy day and it was pretty stressful," he said. "I didn't think I was going to make it � I thought I had to catch at least two more." Brandon Palaniuk used a Megabass Magdraft swimbait to catch 16 fish for 42-05 from Falls on Friday during the Group B elimination round, but found much slower going in the Knockout Round as he finished 22nd with 15-08 on six fish. "I think it was basically the weather � we'd had enough warm nights that those fish pushed far enough along (toward the spawn) that they left where I was catching them," he said. "It was also just flat calm for the first couple periods and there was no water movement at all. I think the fish just suspended and they weren't setting up on any of the structure. "I'd been thinking about bailing all day, but then when the wind picked up at the end of the second period I thought maybe they'd start eating the swimbait again. I gave it another 50 minutes and didn't have a bite, then I made a 30-minute run all the way up the lake where I knew some fish were pulling up to spawn. When I finally got there, Evers was sitting there." The following anglers did not make the cut and will not fish in the Championship Round.